Shimla: The State government is contemplating to set up an agriculture commission in Himachal Pradesh. 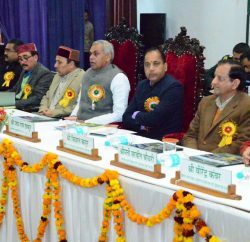 Agriculture Minister Dr. Ram Lal Markanda in a meeting of Himachal Kissan Union, here today assured the Kissan Union to take up matter with the Chief Minister. The Agriculture Minister reiterated the state government commitment for protecting the interests of the farmers. 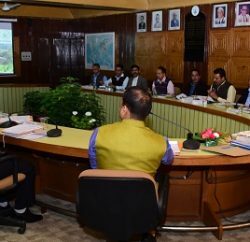 He said the government is considering to set up maize based industry in Mandi, tomato based industries in Solan and chips based industries in Kangra to benefit thousands of farmers of the state. The Kisan Union also raised the issue of damage to crops by the stray animals. The Minister said the state government is working on war footings to overcome this problem. The government is giving 80 percent subsidy to farmers for installing solar fencing so their crops can be saved from stray animals. A part from this state government was committed to build cow centuries in all districts. The first cow century is being constructed in Kotla of Sirmaur district. Dr. Markanda advised farmers to raise their complaints directly to the government so that they can be redressed at the earliest. He also directed the officials to redress the problems received from farmers as soon as possible. The union handed over 29 point demand letter to the Minister who assured that their demands would be considered sympathetically.